A Marine who fell out of an aircraft on a training exercise in North Carolina has been found dead under its flight path, officials said Wednesday. 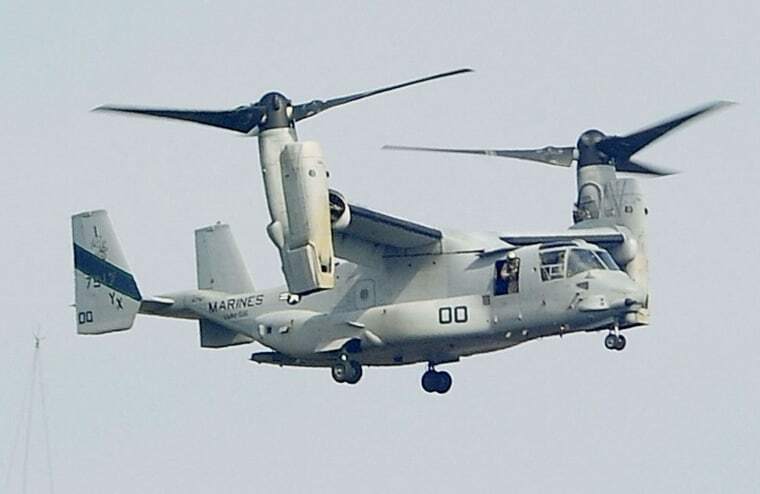 Mystery surrounds how the Marine was able to fall out of the cargo door of the Osprey tilt-rota aircraft while it was mid-flight on Monday. Others on board the aircraft failed to immediately realize he was missing, presenting another puzzle for investigators. "We did not learn of his fall immediately and we are not sure why," 1st Lt. Hector Alejandro, spokesman for the 2nd Marine Aircraft Wing, told NBC News on Wednesday. "It's going to be investigated. It is unfortunate the length of time it took, and honestly we don't know how long that was." The Marine - who was from the 2nd Marine Aircraft Wing based at Cherry Point, N.C. - fell from the aircraft at 6.30 a.m. ET Monday near the small town of White Lake, in Bladen County. Ten helicopters backed up by 100 marines searched for the marine, whose body was found on Tuesday at 2:30 p.m. Officials waited until they had informed his next of kin later that day before announcing the discovery. The Osprey had been performing "touch and go" maneuvers, where a pilot lands and immediately takes off without coming to a stop, at a nearby airport before the incident, Bladen County Emergency Management Director Bradley Kinlaw told NBC News affiliate WECT. The cargo door of an Osprey - which can take off like a helicopter and fly like a plane - remains open during this exercise but marines are always tethered in accordance with standard operational procedure.